úvodní text k výstavě Miry Gáberové v Open Source Gallery, New York, která proběhne 7.-30. listopadu 2015. A stage curtain is a peculiar form of a barrier. It is the barrier between our ordinary and mundane world and an anticipated event of the virtual world of theatre. At the same time it divides the space with a passive position of the viewer from the space of the stage where the artistic process takes place. The curtain conceals, divides and determines the space. In many instances we perceive it as a two-dimensional blind that obstructs vision, not different from a sleepy screen of a computer or closed eyes. Contemporary artists, just like their performative activities, often oscillate on the borderline between the mundane world around them and an artificially determined field of creative process. One of many possible ways how to define this is to use a medium of video. Mira Gáberová uses video especially in this sense. In many of her works, like in the presented one, the video frame reflects the space of artist`s passive presence confronted with a given environment, rather than a theatre stage for an active performance. Here an analogy between the theatre space and artist`s activities is fully expressed by the author. The particular videos capture the artists performing on the proscenium of various theatres. She stands exactly on the imaginary borderline where the stage curtain opens or closes or is lowered and raised. The artist is in a literal physical contact with the curtain in these situations. A minimalist straightforwardness of the performance itself is contrasted by pathos of theatre environment. Mira Gáberová might at first glance present her body as an object, but standing on the borderline of the stage and auditorium proves how important the value of own experience is to her. 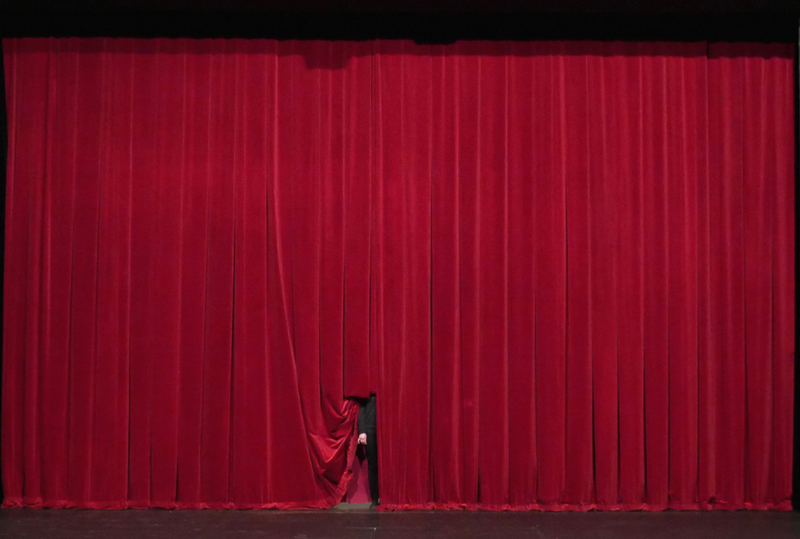 The stage curtain is a three-dimensional actor as well as a spatial object. Simultaneously, it serves as a metaphor for a relationship between an artist and reality, where the intersection between the ordinary and the imagination becomes the matter of physicality. Mira Gaberova (born 1979 in Lučenec, Slovakia ) lives and works in Prague, Czech Republic. She obtained her BFA from the Academy of Fine Arts and Design in Bratislava and her MFA from the University of Newcastle. She has had residencies at the Museum Quartier, Donumenta Regensburg, and the ISCP. Gaberova has exhibited at the Pradelna Bohnice (Czech Republic), Umelka Gallery (Slovakia), Approach Art Association (Hungary), and Oi Futuro (Brazil) among others. Text by Viktor Čech. Čech is a curator, art historian, and lecturer at Charles University in Prague.